CRC? Never heard of it. Controversy and opposition has dogged the Columbia River Crossing (CRC) project for many years. That controversy — along with a daunting price tag estimated at $4 billion — has made it extremely difficult for politicians to vote in support of funding the five-mile freeway widening and interchange building mega-project. Now, with increasing pressure to move forward after several years and over $100 million spent on planning, Oregon Governor Kitzhaber has teed up a bill (H.B. 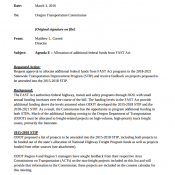 2260) in in the legislature that would make the project an official state priority and would give the state authority to raise revenue through tolling (something they’ll desperately need to come up with Oregon’s $450 million (without interest on bonds or cost overruns) share of the project). 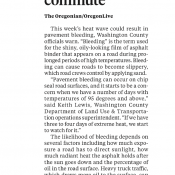 But, as the Willamette Week pointed out yesterday, there’s one thing missing from the bill: the Columbia River Crossing. Rep. Tobias Read (D-Beaverton), chairman of the House Transportation and Economic Development Committee and a strong supporter of the project, says the new name is aimed at clarity, not shaking off controversy. This name change is troubling to me on several levels. First, it seems like an obvious move to confuse the public and cleanse some of the toxicity around this project. I’m not sure who Rep. Read talks to, but I think the vast majority of people in this region are aware of what the “CRC” is and that moniker is arguably more descriptive than “The Interstate 5 Bridge Replacement Program.” And secondly, the new name is simply (purposefully?) misleading. While project staff and boosters want everyone to think this is just about replacing an old bridge, the reality is that the bridge is a relatively minor portion of the project. Estimates put the cost of the bridge replacement at just $800 million. The real money is in the massive new highway interchanges that must be renovated and/or built. Estimates put the highway elements of the project at $3 billion. 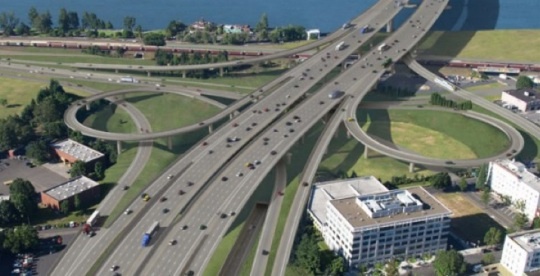 The highway expansion and new interchanges on the Vancouver side alone will cost about $800 million. 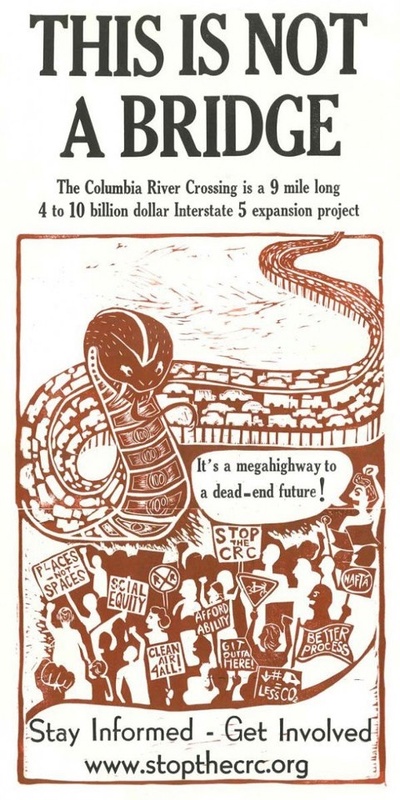 Project backers seem to understand that selling the public, politicians, and the media on “a new bridge” is much more palatable then selling five miles of wider and louder freeway expansions that will lead to even more tailpipe emissions right in our backyards. If this was just a bridge replacement project, it would likely have been done by now. It’s the massive highway and interchange elements that will cost the most money and do the most damage to our way of life. Regardless of what CRC supporters in Salem call the project, it’s future looks no brighter than it has in recent months. The outlook for the project from Washington is getting worse by the day. And, even with a sense of urgency to move forward this session, activists are heating up to make sure it goes nowhere. The forces working to push the CRC along are powerful; but there are also many forces pushing back. 2013 will likely be defined as the year we find out which side is stronger. Stop the I-5BRP just doesn’t have the same ring to it. I’m getting so tired of this kind of disingenuity, but seems like that’s just how things are done these days. If you want something catchier, just call it the BuRP or I5-BuRP. Maybe iBuRP. I don’t know – I-5 Burp sounds like a good name for a bad project that should not happen. This is a Patricia McCaig project. The name was changed on a whim or because the public didn’t understand it. It was changed because polling and focus groups showed the CRC moniker was toxic to the project. If I understand correctly, Federal funding would be somewhere on the order of $400 Million. If they can save $1.8 Billion, doesn’t that still mean they are $1.4 Billion ahead? 1 – Federal funding structure is such that it won’t pay for the “local bridges” suggested by the CRC. It DEFINITELY won’t pay for a light rail bridge across the Columbia that will serve ONE stop. 2 – The Columbia Railroad Bridge is privately held by the sovereign nation of BNSF and there’s no way they’ll agree to have it shut down for a year to be modified. It’s the main rail corridor for the west coast. Todd “H”…a correction to your item #1…the LRT portion of the project currently plans for 5 sets of stops (includes 1 in OR). …but who knows how many will be funded given all the signature collecting up here to kill the transit portion of the project. But then there’s LaHood sticking around at Transpo. Wonder if would support light rail without a full-on highway project attached? Clark County could sure use it, even though it’s not popular with some. Seattle went through the same denial process from the sixties up to the aughts. Sigh. I would not be surprised if their (back-up) plan to deal with its seismic (and other) obsolescence is to wait until it collapses and then ask for emergency federal bailout funds. OTOH, maybe a creative deal could be worked with fed and local funding to build a parallel bridge so that they would not suffer any downtime and would be prepared for a “big one.” Perhaps part of that horse trading could be considerations for Sullivan’s Gulch and NoPo Greenway access. Of course, if no local officials will even touch that proposal (i.e. CSA) then it will never happen and we’ll all end up paying for the disaster relief, and an extended time with no service after the collapse. This is what I would love to see happen. Buy off UP and BNSF by funding a pair of rail bridges, one paralleling the current Willamette bridge in NW Portland, and another paralleling the Columbia river bridge. This would expand capacity to 4 tracks between Portland and Vancouver, enabling a dedicated line for intercity and commuter rail, and providing a backup for the existing main line. This would provide UP and BNSF with an insurance policy on their main line, and provide alternate routing for track and bridge maintenance. In trade, the city would get rights to build the NPGW and Sullivan’s Gulch trails. My guess would be around $500 million for the whole deal. You get two fantastic new trails, 10-minute commuter rail to Vancouver, faster intercity rail, and a more robust and safer rail network for the metro region. Ooh! New Coke! Okay, I’m totally buying this project now, since it has a different name and all. Could we get some more millions of dollars thrown at it as well? TASTY! I’m disappointed that Tobias is a strong supporter of this mismanaged boondoggle. If he remembered his microeconomics, he’d know the thing to do is toll the current bridge to manage demand, not use tax dollars to build a new bridge. Toll the current bridge to manage demand? Like that will make everyone happy. The current bridge has been inadequate for decades while Portland continues to grow. Build the bridge. Please. Thanks for the article, Jonathan. Folks – channel your outrage into the public sphere. Write/call your legislators. Write/call the city council. Write letters to the editor. Attend your legislators’ town hall meetings. Speak up! When you call, demand a written letter on their position that explains why they will not support the CSA. What a load. A simple bridge replacement would be under $1 billion. Calling it a “bridge replacement” is a bold-faced lie. The bridges have 60 years of life left in them, but the CRC (McCaig) doesn’t want you to know that. Thanks for this article Jonathan! In less than 50 years the Portland area is expected to have a population of 3.85 million people (Metro study). Think the present bridge can handle that? Certainly, if additional capacity is built by adding light rail, bike ped access, and perhaps a couple extra lanes which can switch directions depending on the time of day. All of that can be handled with a third bridge though and would avoid the costly interchange enhancements. Depends on if the additional residents will be forced to burden themselves (and all taxpayers) with their single-occupancy cars or not. If 21st-century planning is allowed to work, then more efficient means of transportation will win out. The fact that a bridge is not sufficient to handle unnecessary SOV traffic is no fault of the bridge. I came from Minnesota, where CRC meant “Cars R’ Coffins”. Still seems fitting. 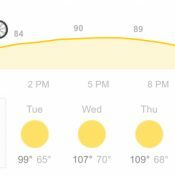 We’re just one change of heart away from our “cool temperamented” mayor away from beginning a massive, unfunded freeway expansion from the Columbia to the Willamette. Please attend the Bike Walk Vote event, and invite you friends. 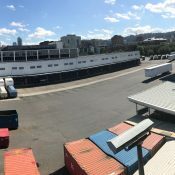 This project and the potential coal train/export terminal will define whether or not Portland and Oregon are willing and able to step forward or backward into the 21st century. The reality is that CRC/BuRP is a waste of resources to fix a problem that doesn’t exist. AND it is increasingly clear that the math doesn’t add up. Tolling won’t generate the padded revenue as predicted, and while the bridge will fill with Single Occupant Vehicles stuck in traffic, that doesn’t mean it is more efficient. Sadly, I also believe the city and state will only fight for PBA-approved proposals so light-rail and bike-specific infrastructure will quickly (have already?) be dropped from the plan. It is also increasingly clear that the city is run by people who don’t live within city limits, and don’t have to live with the consequences of their decisions. (This is also recognized, if not talked about, within the city according to some folks I’ve talked to.) The negative consequences of this plan wouldn’t matter to someone who doesn’t have to deal with the herd of WA residents that clog NoPo neighborhood streets every day while they use the area as a park-n-ride. I would suggest everyone short circuit this doublespeak rebranding by henceforth saying “CRC/BRP” or “BRP/CRC” every time. Or CRC-BuRP! I am thrilled to see your continuing coverage! thanks for keeping us informed and providing a place to get the information they need to get involved! … still smells the same. I don’t think this project would ever be considered if it were entirely paid with user fees (tolls and gas taxes). It’s only possible because other funds are being considered. Requiring road construction and maintenance to be paid entirely out of user fees would be a huge incentive to prevent unnecessary construction. This is really outrageous. The CRC project is so wrong on so many levels, it makes you wonder what the motivations are to keep this going. 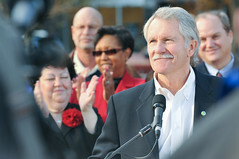 Is Kitzhaber really convinced that we need this project? I thought he was smarter than that. 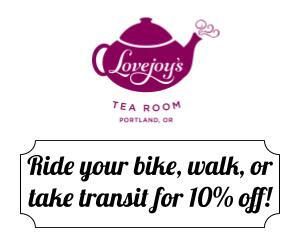 See you at the BikeWalkVote effort on the 1st. Thanks to Crank for hosting. I’ve written to the governor months ago about my disappointment in his pro CRC stance and got no reply. I don’t think letters to legislators are going to help because they are all for it. There is something political going on and only those in the know know. Washington state may be our only hope as they are against light rail and tolls. LOL. 007 – it’s not true that all legislators are for it. There are a lot of legislators against it (Frederick, Greenlick, Shields, and many others), and a lot of folks who don’t care much either way who citizens speaking out could shift. This is a basic vote-counting exercise, and while the highway lobby has the lobbyists, our side has the people. And at the end of the day, legislators represent constituents, and voters decide if legislators keep their jobs, so we have some real leverage. The strategy of the pro-CRC folks is to get people to believe it’s greased to go. Don’t believe it. For what it’s worth, when I was covering this project in Vancouver, the CRC staff consistently asked us not call it a bridge replacement project, but rather a five-mile project of freeway, interchange, light rail and bridge work. The project is officially called the CRC, the website is still columbiarivercrossing.org. Not sure what this all means, but it’s interesting to watch.